Liz mock lead climbing. Photo by Allie Russell. A few days into our course at Cochise Stronghold, our instructor team taught us to place protection and build anchors. Sitting atop our route, we took a break before rappelling down. Surrounded by massive walls and sculpted spires of granite, the majesty of our environment was almost palpable. Birds of prey soared overhead; lower down, white throated swifts awed us with their silent agility. This landscape. Be patient. Let it take you to new places. Standing tall for so long. Solid. Rock. The Fist, pumped into the sky. An “unkindness” of ravens crying above, circling the Fist, landing at the apex. 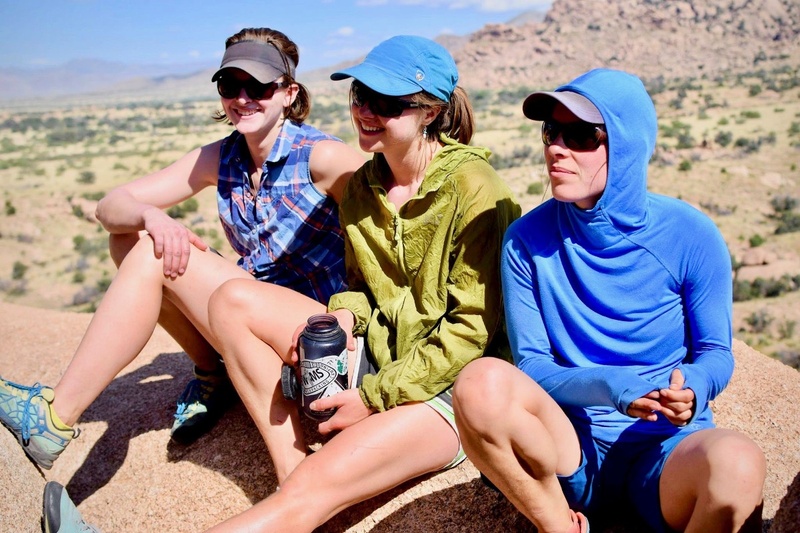 As we rested on the rock, our instructors led us into a discussion about the reasons we chose this all-women’s course. I had registered for the course for many reasons, but my essential motive was to be in a positive, supportive, and encouraging environment. Coursemate Heather tying a figure-8 knot. Photo by Liz Johnson. We were sixteen women, students and instructors. Sharing our individual strengths and vulnerabilities in a non-competitive, non-judgmental setting brought us together. Early morning runs and sunset walks bookended days at the crags. While cooking pad thai, we talked about spices and about life. We lay on our yoga mats under the stars and remembered constellations and dreams. We spent our days climbing, gaining strength and prowess on the rock. In turn, our confidence and sense of empowerment grew. “But how do you keep that feeling after the course, when you’re back in your regular day-to-day life?” my coursemate Heather asked. “Take another NOLS course,” I said. My reply landed a few laughs, but I said it only partly in jest. Continuing to challenge ourselves is vitally important throughout life. For it is through meeting challenges that we gain confidence. I believe building confidence is like building fitness; as soon as we stop challenging ourselves, our confidence begins to ebb. 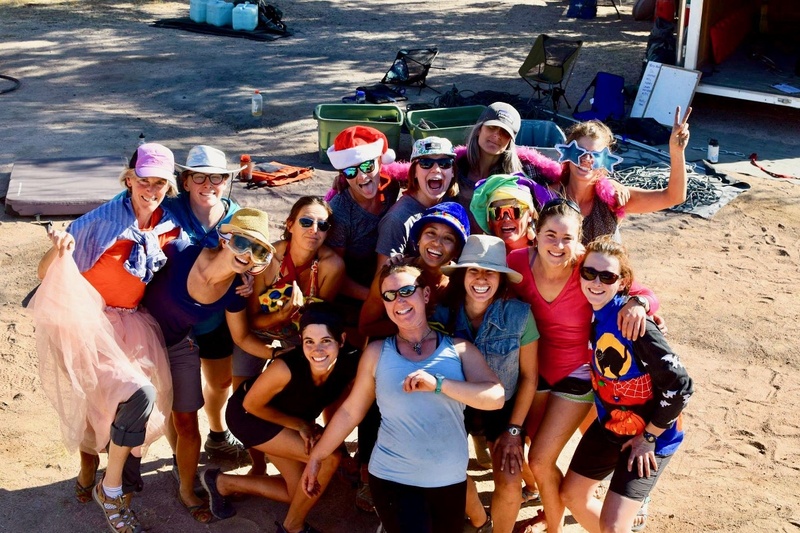 A NOLS course is a life-changing experience that stays with us; but over time, we all need to reinvigorate our bodies, minds, and spirits. Part of the instructor team, left to right: Tasha Block, Johanna Garcia, and Kristen Cole. Photo by Allie Russell. 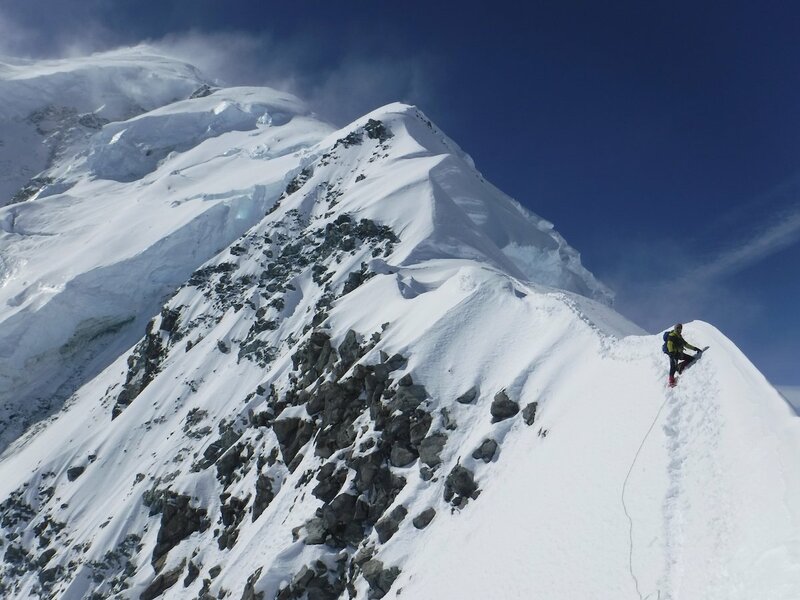 When we climb, we face challenges that require us to make choices. 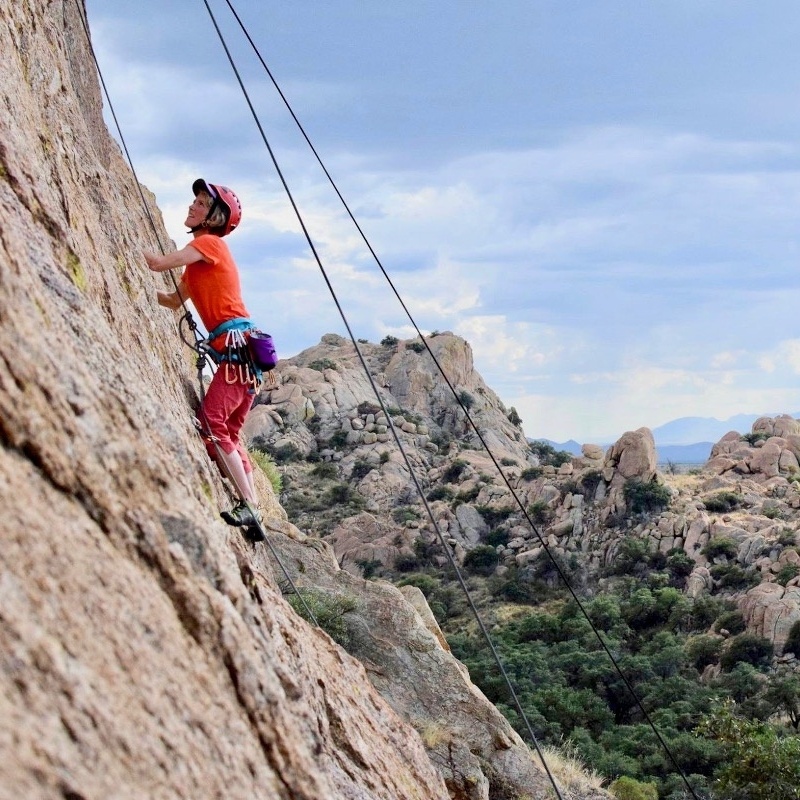 Being daunted by a crux point on the wall, we can choose to retreat and try the route again another time, or we can try to solve the problem, pushing ourselves further. Sometimes we fall off the wall and are caught by our partner. She maintains tension as we swing—and in that moment are we able to see exactly the handhold that we need. Coursemate Molly preparing to rappel. Photo by Allie Russell. Our last climbing day found us back at Sweet Rock, the crag where we had started our course. We had come full circle in so many ways. 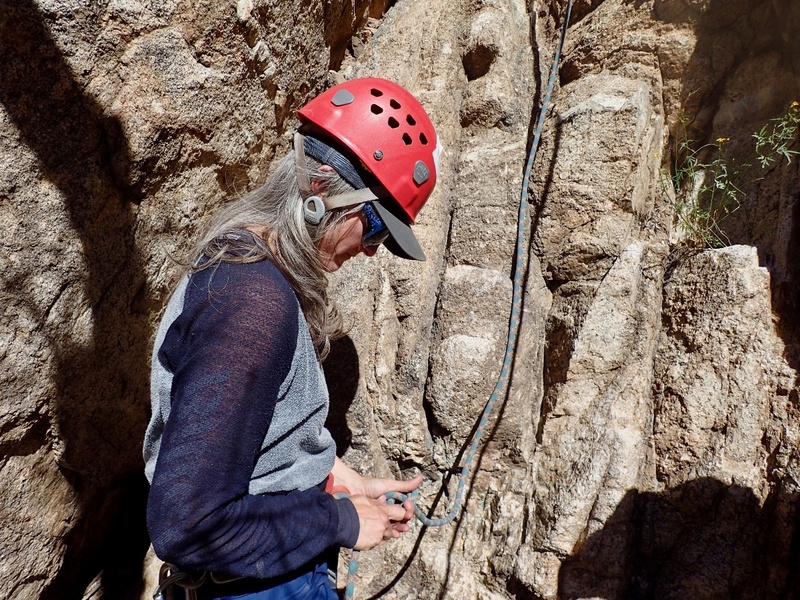 My coursemate Tami was belaying me on an exacting route that I hadn’t tried on our first day. As I came to the crux, I knew I had a choice. Being tired from a week of climbing, I faltered. Tami called up to me, “You got this!” Her well-timed words were all it took. I made the next move and finished the climb. On the final afternoon of our course, we all worked together to inspect and organize the climbing gear. We sat behind the equipment trailer on tarps, talking and re-coiling ropes, laughing and counting carabiners. The day moved on as the sun moved across the sky, but we stayed in the shade. A breeze played in our unwashed hair and a decent playlist sounded from truck’s speakers. As we finished our tasks, the instructor team slipped into the trailer and re-emerged dressed in crazy costumes. We danced to the music and I, age 55, joined right in. 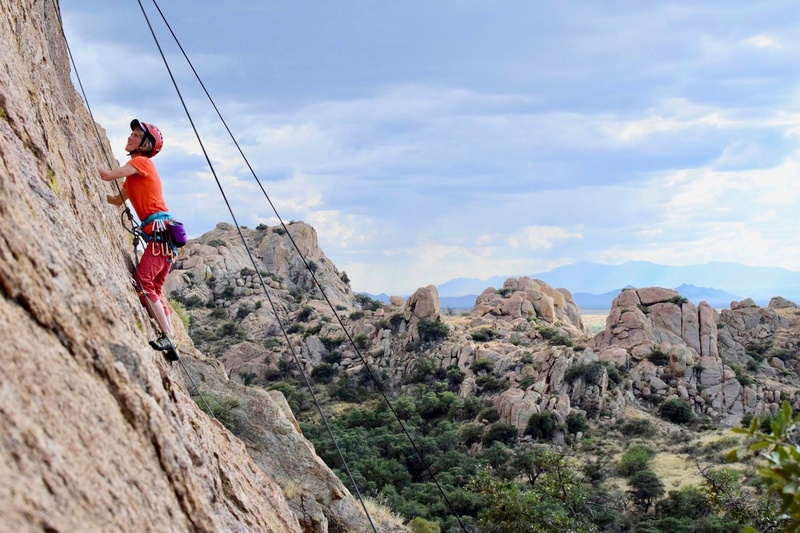 My body was tired, yet energized from climbing; my mind was empowered from my week in the desert wilderness; and my spirit soared. Dancing at Cochise Stronghold. Photo by Allie Russell. 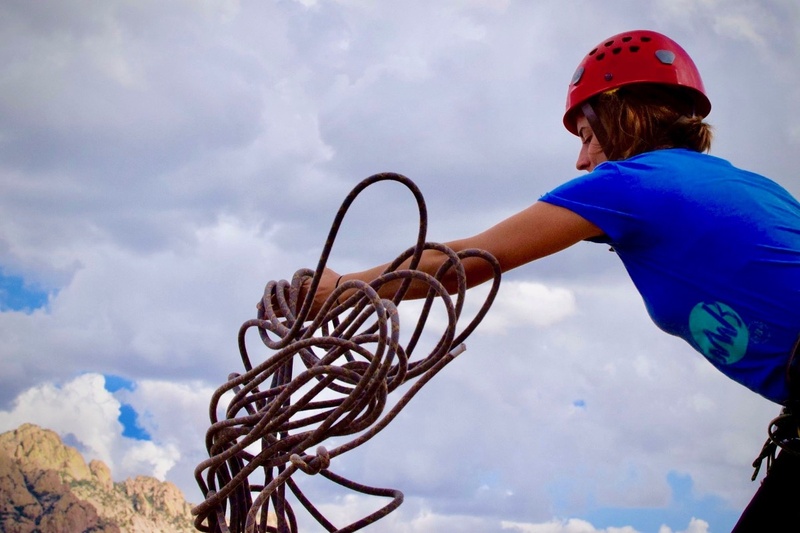 See Liz's course, Southwest Women's Rock Climbing - Prime. Liz Johnson is a Registered Maine Sea Kayak Guide. In her sixth decade, she has found herself inexplicably drawn to helmet sports.